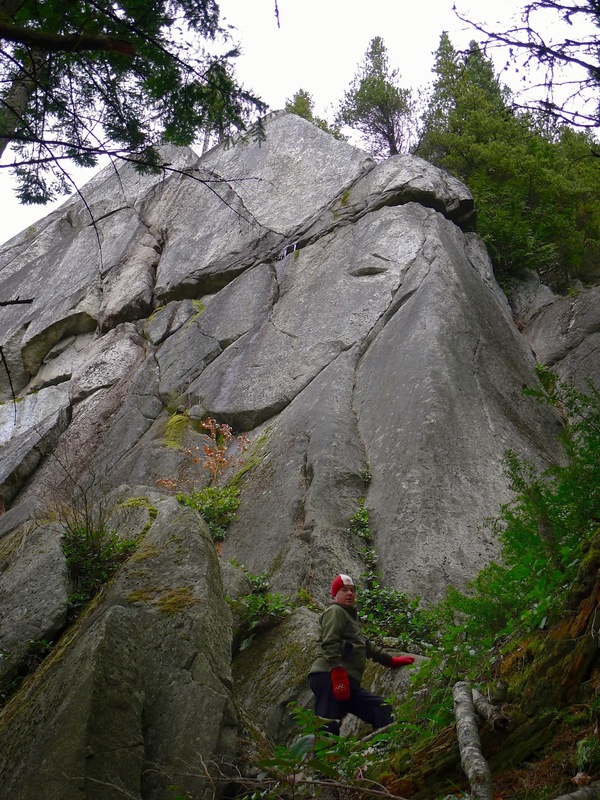 Today Joe and I hiked the Smoke Bluffs, some granite outcroppings favoured by rock climbers. A friend had told us about a new trail on the bluffs and we were keen to try it out. A post at the trailhead warned us about having to use chains and ladders further on up the trail. We started the hike and quickly encountered a knotted rope to pull ourselves up a granite boulder. I tried to hoist myself up, but the granite was wet and my hiking boots couldn't grip the slippery rock. I said, "I don't want to hike this trail. Especially if we have to use chains and climb ladders." "You go on ahead," I said to Joe. "You hike it clockwise until it joins the Loop Trail. I'll go Loop Trail and hike it counter-clockwise. We'll meet in the middle and walk back out together." Joe went his way and I went mine. I began my ascent up the mountainside. A woman was coming down the path. We smiled at each other. She asked, "Do you know these trails?" "Kind of," I replied. "Why?" "Well, just to let you know, there's an old man up there acting weird. He's wearing a toque and just wandering around. He's standing at the junction of two trails, looking at his watch. Luckily I was able to lose him. But I just wanted to warn you because you are hiking alone." I explained to her that my husband and I were meeting on the trail up above, so for her not to worry. I wouldn't be alone for long. Then she grabbed my arm and said, "OH MY GOD! I AM SO SORRY! IT'S YOUR HUSBAND UP THERE!"